This was an evening filled with duels between balafon and djembe; djembe and vocals; kora and balafon. 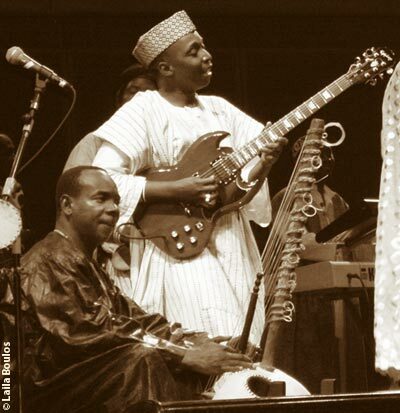 Intricate interplay, especially between the kora and balafon, was the raison d'être of the musicians that night. The first battle to take place occurred between the balafon and djembe. The balafon player, first on the scene, opened the evening with Whirling Dervish force but was shortly overtaken by the djembe player attacking his instrument like a Veg-O-Matic contraption gone wild  chopping, slicing and dicing. But....his reign was short-lived as the Wagner-esque fugue of the synthesizer attempted dominance. As the musical intensity grew more taut, the first singer bounded onto the scene greeted by cheering. A gargantuan fireball, this vocalist spun his tazmanian devilish powers into every corner of the stage during his encounters with the other musicians. Amidst all this brouhaha, Toumani smoothly and quietly slid in, accompanied by greater cheering. As the 'duelling' resumed with the djembe player and singer battling for supremacy, the crowd was stirred into a wall of cheering frenzy. All evening, the pure endless intensity of the playing was exhilaratingly head-spinning. And at times the repetitive rhythms, so passionate and emotional, were akin to being tickled relentlessly with a feather. There were many deft changes in mood and intensity throughout the performance, but they were imperceptible until you were right in the middle of them wondering how they had transpired. This back and forth change in tone which occurred throughout the evening was akin to jumping effortlessly from a rowboat to a high-powered yacht and back. The evening positively gushed with these musical sun-bursts which were a testament to the subtlety and skill of the musicians. The first vocalist disappeared in a flurry leaving the stage free for the arrival of his replacement. The second singer, no less intense than the first, divided his time in the spotlight between asserting his vocal muscles and commanding the audience to pay attention as each musician showcased his virtuosity. He was a master in instructing the crowd to clap at certain intervals and sing in others. Extremely dramatic and visually appreciative of the talents of his colleagues, his on-stage antics were as consuming as the playing of the musicians. Many people were feverishly dancing in the aisles and standing ovations greeted the finales of most songs. There was a lot of action and boys-in-the-schoolyard playfulness among the musicians. So refreshing, it definitely added to the enjoyment of the performance for everyone participating. In direct contrast to the above frenzy, the spellbinding siren of the kora, like a gentle, breathtaking rainbow after a storm, glowed effortlessly at many intervals during the evening. This shimmer of dulcet tones contrasted sharply with the various comings, goings and playful musical jumping-ins of the other musicians throughout the performance. One of the high points of the evening presented itself when Toumani sat alone on the stage with his kora. He proudly informed the crowd, to rousing and awe-filled applause, that he belonged to the 71st generation of kora players in his family. Then, with the undeniable warmth of a grandfather sitting you on his lap, he gently began to wrap the audience around his fingers as he proceeded to give them a brief tutorial of this, his preferred instrument. Touching upon many of the other African instruments along the way, this musical journey led by Toumani was at once fascinating and mesmerizing. But, the final after-the-wine-has-spilt seduction arrived during Toumani's final set. The Prince of the Kora took over the room, filling it with a multitude of lush strains that, although light, were so heart-wrenchingly passionate they brought many in the audience to tears. Being one of them, I know this to be a fact. His manipulation of the kora coaxed forth such exquisite sounds that if he played forever it would have been too short. 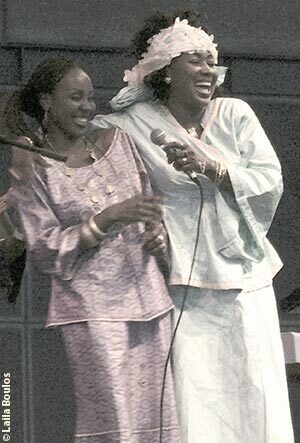 During this dreamlike performance, Toumani informed the crowd that music was the international language. Looking around the room full of cheering, dancing-on-air fans, the message was clear. And at the end of it all, no translation was required for the standing ovation Toumani and his Symmetric Orchestra received as everyone was speaking the same language.